Hey guys, today's post is something I'm actually super excited about! As autumn is my favourite season I couldn't resist doing a tag all about it. 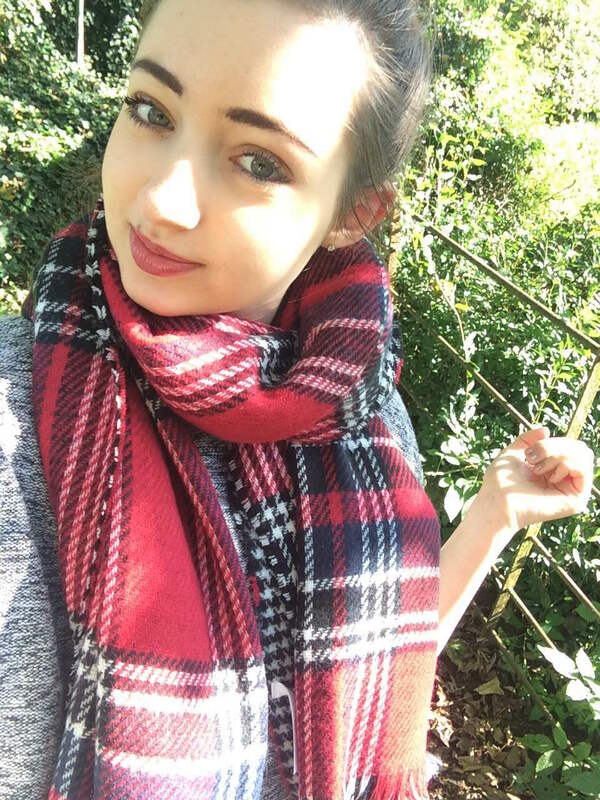 The photos above were taken on my iPhone (so excuse the quality) a couple of days ago when my dad and I went on a cute autumn walk around our village together. And lastly before we get onto the tag, if anyone was wondering my scarf is from Primark! Ok we’re talking coffees – what’s your favourite seasonal drink from Starbucks/Costa/Cafe Nero, etc.? Guys okay, don't judge me for being such a white girl, but I genuinely love the Pumpkin Spice Latte! It's so sugary and moorish and cinnamony... Ahhh I love it so much! But that's like a treat, if I'm just getting a coffee I'll have a vanilla latte or a caramel macchiato. Well, if you can tell from the photo I'm all about the scarves. The one I'm wearing is so soft and cosy - it's like a wearing a blanket. All things considering, it was £7 from Primark so basically the best purchase ever?! I'm also a guilty lover of Ugg boots. I have two pairs, a short black pair with one button on the side and the traditional tan colour with two buttons up the side. They're just so warm and comfortable! Something relaxing and gentle. I've never really been one to follow the top 40 and honestly couldn't even tell you who's the 'it' artist at the moment. But for me, at the moment I've been loving listening to Gabrielle Aplin, her songs are so melodic and perfect for this time of year! I've actually done a post about this which you can read here. But ATM I've been loving Jimmy Choo Illicit which I don't actually own so I've just been spritzing the testers at work! Also I love my AW staple Dot my Marc Jacobs. Most likely my usuals... Yankee candles in scents like Salted Caramel, Fireside Treats and of course Christmas Cookie! What do you mean it's not Christmas yet?! Autumn is just the best. Even looking out of my window right now I can see golden leaves, all different hues of burgundy, orange and green. I adore lighting a fire and having cosy nights in watching Strictly and Bake Off (cries that it's over and Tamal didn't win). Not to mention the fashion and beauty at this time of year is just so. on. point. Definitely warming to a super bold lip! If i'm not feeling so wild as to wear my Charlotte Tilbury Glastonberry lipstick I adore MACs Capricious as it's the perfect touch of plum! Also I'm a massive ambassador of the bronze / gold eye look. I think it's so beautiful especially with blue eyes as it really makes them pop! Add a touch of rose gold blush and you're good to go! The weather cooling down... halloween... cosy pamper and pizza nights... As Christmas is approaching fast also looking forward to Christmas shopping as it's one of my favourite activities!! 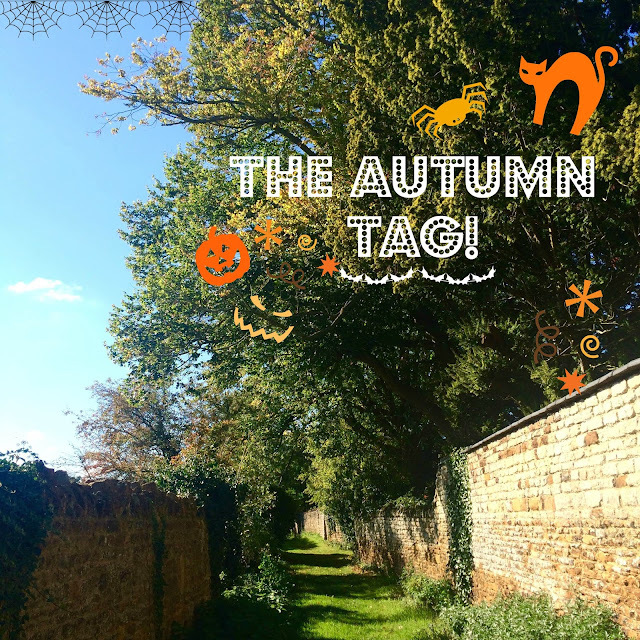 Okay, so that was my Autumn Tag! I tag all of you who read this to do the tag and then leave me a comment with your post linked so I can check it out. Much love! I've wanted to do this tag for a while now, so I can finally do it! Such a good post idea! And love that scarf! Love the post! My favourite Autumn/Winter drink is either the Black Forest Hot Chocolate or Spiced Apple, both from Costa!